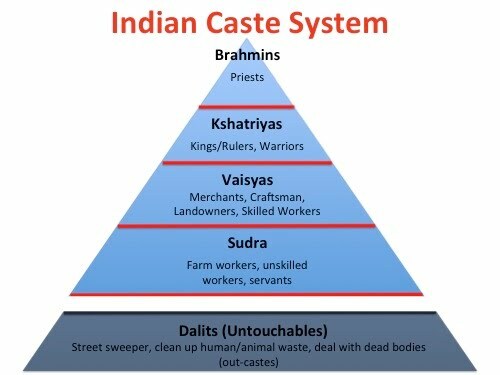 Caste system in Ancient India: Ancient India period is from Indus valley civilization to Gupta dynasty. After this period was the medieval period and later modern Indian history. India is a culturally rich country from time immemorial. .
Caste system played a predominant part during ancient India. Aryans who came to India brought along with them their beliefs, customs and social behaviour. They divided the society into four castes. The four dominant castes were Brahmin, kshatriya, Shudra and Vysya. Brahmins were considered as superior and were respected by all other castes. They were mostly Gurus (teachers) and priests. Kshatriyas were rulers/ defenders of the country. Vysyas were the traders. Rest of the people who did mean jobs were called shudras and were untouchables. In a way the caste system was essentially division of society based on their work. The caste system consists of two categories known as Varna and Jati. Varna is a system that has its mention in Vedic period which divided the society into four classes as mentioned above. But it is not clear how and when Jatis came into existence. During the later Vedic period the caste system became more rigid. The shudras were made to do mean jobs. However, it is important to note that there is no mention of untouchability in any of these texts in ancient India. These texts also do not mention that shudras should not enter temples or any other scared places. It can be said that the main purpose of caste system which started in Vedic period was to decongest society and to divide the work among the people. The caste system became more rigid in later Vedic period. Brahmins became the superior power in the society and the Shudras became untouchables. Even marriages among different castes were barred. The shudras started to live an isolated life in the society. During the period of Sutras the caste system became further more rigid giving more importance and prominence to Brahmins. The kshatriyas who were the warrior class became more powerful. Restrictions and punishments were imposed for inter caste marriage. A number of sub castes emerged based on the occupations. The caste system was made with an intention to divide the work among the people and for the economic growth of the country but however it became a hindrance and caused lot of problems. Many sub caste slowly evolved thus dividing the society. With the emergence of new religions like Buddhism, Jainism casteism lost its sheen to some extent. King Ashoka himself embraced Buddhism after Kalinga war. Even now casteism is present and many political parties are taking advantage of these castes. If you make any purchase via a link on this site, I may receive a small commission with no added cost to you. Talakadu is a desert like town located at a distance of 45 km from Mysore district on the banks of river Kaveri.